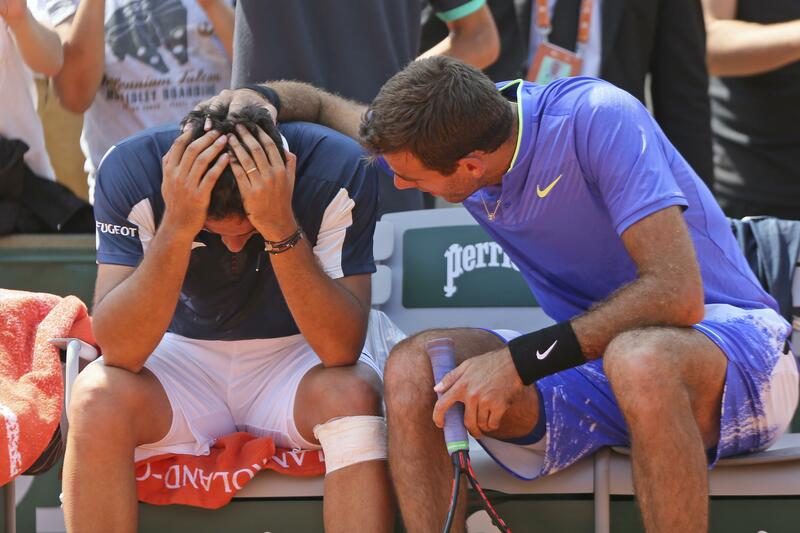 Thu., June 1, 2017, 9:25 a.m.
PARIS – Juan Martin del Potro quickly went from fierce competitor to friendly consoler at the French Open, showing deep reserves of compassion for an opponent who had to stop playing their second-round match because of a knee injury. Del Potro’s own career has been a series of stops and starts because of a series of wrist operations since he won the 2009 U.S. Open. The 29th-seeded Argentine said that helped him empathize with the plight of Nicolas Almagro, who dropped to the clay court, bawling, early in the third set Thursday. Almagro was taken to a hospital, an International Tennis Federation spokesman said. There were unusual scenes out on Court 2, where Almagro, a 31-year-old Spaniard, had his left leg treated and taped by a trainer. At 1-all in the third set – del Potro took the first, then lost the second – there was the startling way Almagro paused at the baseline, placed his hands on his knees and shook his head, then fell backward onto the court. He caked his blue shirt with rust-colored clay. While Almagro was down, the 6-foot-6 (1.98-meter) del Potro climbed over the net and walked over to check on someone he’s known since they were teenagers in the junior ranks. Del Potro leaned over to talk to Almagro, patting him on the chest. “I just do what my heart feels,” del Potro said. Once Almagro eventually rose, they met for a lengthy hug. And then, after Almagro ambled over and rested on a sideline seat, del Potro plopped himself right beside his pal and tousled his hair as they chatted. He said he told Almagro to think about his family and his baby. Del Potro will face No. 1 Andy Murray on Saturday for a berth in the fourth round. It’s a rematch of their final at the Rio Olympics, where del Potro’s silver medal marked a significant step in his comeback. He missed 2 1/2 years’ worth of major tournaments because of three operations on his left wrist, returning to Grand Slam action at Wimbledon in 2016. This is his first appearance at Roland Garros in five years, and before Almagro’s injury, del Potro dealt with his own issue – a bothersome groin muscle that he tweaked in the first set Thursday. Some anti-inflammatory pills helped, he said, and he thinks he has enough time to recover before taking on Murray. Published: June 1, 2017, 9:25 a.m.